You’d be surprised at the number and varied species of fish that regularly patrol ocean shores in search of food. When I think of saltwater fishing, deep sea usually comes to mind. This means getting a boat and going several miles from shore. Surf fishing can be just as productive as deep sea fishing. In some cases, it can be more productive. Many of the same species of fish that are caught offshore can be caught surf fishing. This is due to fish following schools of smaller prey fish near the shore. Depending on the tide and a few other elements, the shore can be a prime fishing location. Surf fishing differs from pier fishing in that there are several factors you have to consider. 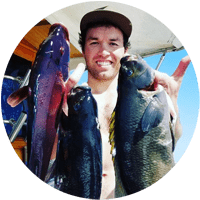 In this article, I am also going to cover some of the best surf fishing rigs, surf fishing tips, and much more. 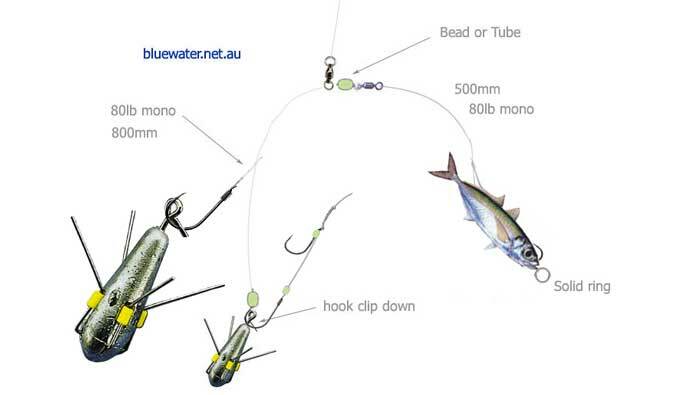 Starting with these four simple surf rigs, you’ll be well on your way to catching more fish! Surf fishing is fishing from the shoreline. You are casting as far out as you can to reach your target fish. Depending on the location, anglers will wade as far out as they can to get a farther cast. Extreme care must be taken when doing this. There are some strong currents and undertows that can sweep you farther out into the water. Other things to watch for when surf fishing are sharp bottom objects, stinging/biting fish, and crustaceans. Chest high or at least hip high waders are recommended to prevent these issues. They will also keep you dry which allows you to be in the cold water for a longer duration. Extremely long rods, from 7 to 16 feet with the best surf fishing reel make for a fantastic saltwater rod and reel combo that are frequently used to extend the length of the cast. While specialized, two-handed casting techniques are used to cast the lure or bait. 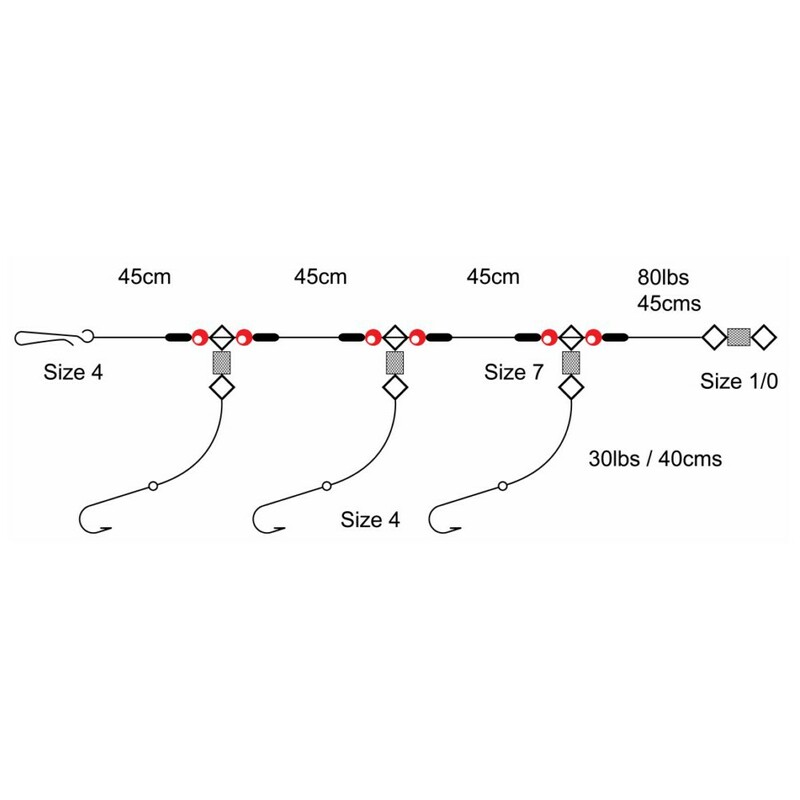 This helps ensure the added distances required in many cases to reach feeding inshore fish. In addition to standard two-handed casts, many surf casters also resort to the pendulum cast (derived from tournament casting contests). This is to achieve added distance. In some cases exceeding 700 feet. Tournament casting is a sport in its own right, with the world record held by Danny Moeskops casting a distance of 286.63 meters (313.46 yards). There are certain zones to cast baits that are more profitable than others. It depends greatly on the confirmation of the seabed as well as conditions. By observing the waves motion, in particular where they break out, this is important. It is there where the bottom height is lower and the sea current can stir it most. This action uncovers from the sandy bed, small marine life and carries them away across channels to deeper points. this is where they become the prey of fish. Tides dictate a large amount of what may be biting. The feeding cycle of many fish is directly affected by the movements of the tides. For example, during the middle period of the tide, instead of the peak of the low or high tide when the water is “slack “. Snappers and a lot of other fish species tend to feel more excited when the water is flowing. However, the fish biting regularly slows down or stop biting altogether with a slow or high water flow. This is the reason for the variation in the diet of fish species from one region to another at different times. What may seem common to certain fish species eating habits in one place may not be the same anywhere else, even at a short distance away. These are a few of the many species of fish that can be found along the shores of coastal waters from east to west. For most of your surf fishing, you will find that a simple flapper rig, either a one, two or three hook version, will best fit your needs. These are the simplest and often most effective of all surf fishing rigs. They produce excellent results. The best approach is to tie the hook trace onto a swivel, and locate the swivel on the body line between a couple of beads and locking crimps. This gives the snoods a much better chance of dealing with any line twists caused by the bait flapping around as it flies through the air on the cast. Or while sinking to the seabed. On a two or three hook flapper rig, the lower snood can be longer to give better bait separation on the seabed. Tied in this way, they are known as ‘1up-1down’ or ‘2up-1down’ flapper rigs. Clipped rigs are more complex than the flapper rigs, involving two more components, a bait clip for each snood, and a bait stop for each snood. These 1, 2, and 3-hook clipped rigs end in a link clip rather than a bait clip. This means that an impact lead must be used to provide a clip for the lower hook to be clipped to. In the 2 and 3-hooked rigs, the rolling swivel at the inner end of the dropper has been replaced by a cascade swivel. This incorporates a clip for the hook above it. 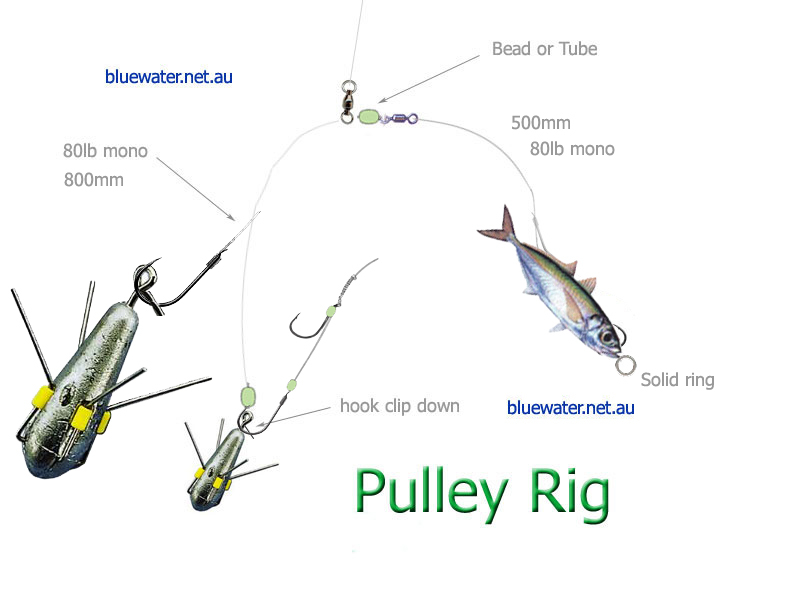 Pulley rigs use the swivel to act as a pulley between the weight and the biting fish. Impact leads have the bait clip built-in alongside the attachment eye. In strong tides, you may have to go for the spiked version to keep the rig anchored where you want it. You could use a standard link clip together with an impact shield. These are threaded on the rig main body line just above a standard link clip. They serve two purposes; first to provide a clip for the lower hook, and also to provide some protection for the bait as it lands at the end of the cast. The top hook is clipped to the cascade swivel of the second hook snood, and so on. The reason for using bait stops is, during casting, the clipped-down hooks fly ‘bend first’ through the air which forces the bait over the eye and up the snood. Or it would, if it not for the bait stop to prevent this from happening. An un-clipped flapper surf fishing rig will allow the hook to fly ‘eye first’ which keeps the bait located firmly in the bend of the hook. In this case, so bait stops are not needed. 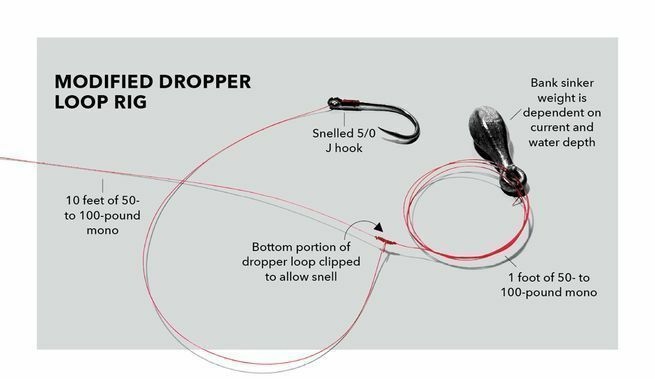 In the loop rig, the cascade swivel is tied in the snood close to the hook. This clips the lower bait in tight and forms a loop in the line between the rolling swivel and the cascade swivel. The three hook loop rig was developed for casting long-snooded clipped rigs long distances. This is a variation of the lower dropper in a ‘1-up, 1-down’ or ‘2-up, 1-down’ version of the clipped down surf fishing rig. It would be too long overall for all practical purposes. This is a surf fishing rig designed for fishing over rough ground. More often than not the lead weight is what gets caught. 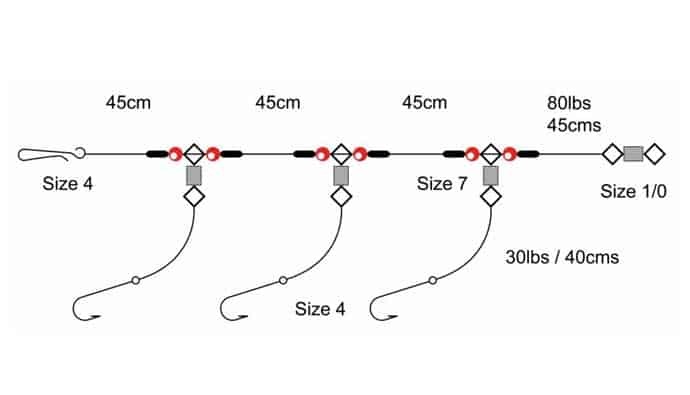 The Pulley Rig has been designed to eliminate this risk by allowing the weight of hooked fish to pull the lead weight into a position ahead of the fish. It is much less likely to get hung up. Used with an impact lead or an impact shield, the simple pulley rig is capable of being cast very long distances indeed. 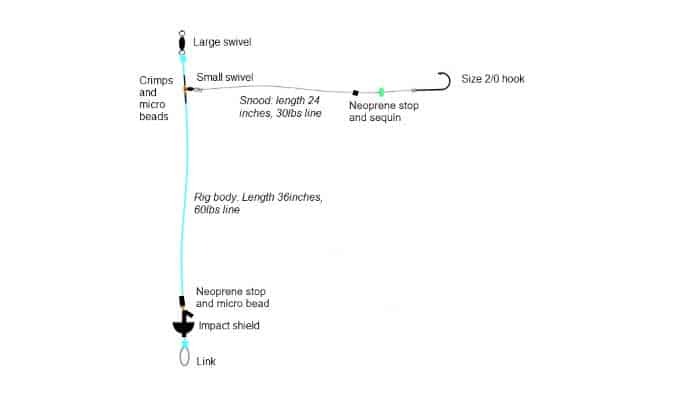 As a long range surf fishing rig, it is often used with a tandem hook Pennel rig for large baits. This also helps the rig hold larger fish. 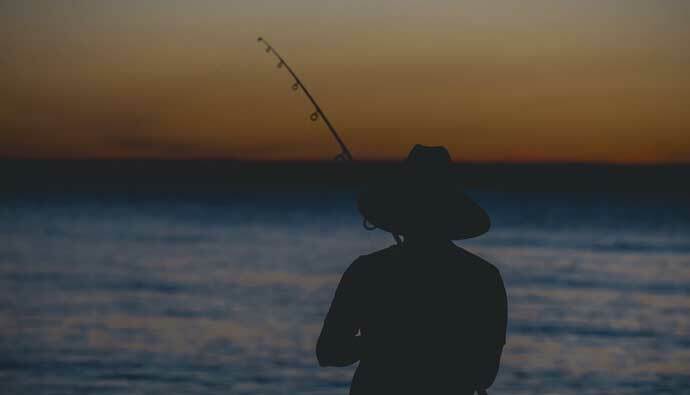 The type of bait used for surf fishing largely depends on the species of fish you are fishing for. Most saltwater fish eat shrimp, live or dead. Usually, shrimp attract bluefish, redfish, and other sportfish. If you are going to use dead shrimp, it is recommended to remove the head and tail before baiting on your hook. Mullet are fish that many sportfish eat naturally in the wild. It is best to cut it into chunks before baiting to your hook. Smaller crabs almost always work well for sportfish. When using small crabs, use the whole crab. Also known as mole crabs, wash on shore in large groups. They dig themselves down into the sand. You can use a small rake to uncover them. Store them in a bucket with wet sand in the bottom. Squid make an almost irresistible bait for many sportfish. It can be purchased fresh or frozen at many bait shops. You can use squid whole or cut into pieces. Surf fishing is a great way to fish. It allows you to get at some nice sportfish without involving a lot of expense or having to use a boat. Once you get the hang of surf fishing, it can be a lot of fun, and an all around great experience. Surf fishing rigs come in many different styles. We have named a few of the more common ones in this article. The fish finder rig, redfish rig, striper rig, and The high low rig are a few other notable mentions that work very well. Thes rigs are also some of the easier ones to fish with. This is especially good for a beginner that is just learning to surf fish. Q: Best bait for redfish? A: Crabs and shrimp are the primary bait of choice for redfish. Q: How to catch bluefish? A: Trolling, or casting artificial lures Is the best way to catch bluefish. Cut baits are also a good choice for catching bluefish. Q: How to fish from the beach? A: This is known as surf fishing. It is important to fish according to the tides for optimal results. Surf fishing takes a good amount of upper body strength. Once you have your surf fishing rig, you will want to cast your line as far out as you can. This is while standing as close to the surf as you feel comfortable. Remember, the farther you can cast the better your results will probably be. A: This will depend on the species of fish you are fishing for. As a good rule, live baits such as crabs and shrimp generally work well for many species that can be caught surf fishing. Q: How to catch flounder from shore? A: Galveston surf fishing offers some great flounder fishing. Flounder being an ambush predator, will usually respond to jigs and live bait. Q: How to tie a high low rig? A: Using 50 lb test leader material, cut off a 3-foot length. Leader material is sold in loops and is stiffer than spooled mono. On each end of the mono length, tie a double surgeon loop knot. One foot from each end of this knot, tie a dropper loop knot. 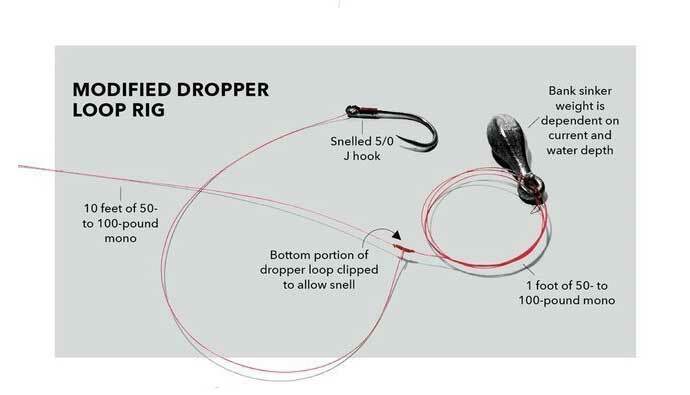 This will give you two dropper loops for your hooks. Run the loop through your hooks, hook your sinker on the bottom. Q: How to make a pompano rig? A: There are several opinions on how to tie a pompano rig, here is an example. Tie the Palomar to the swivel 10″ or so from the first drop. Two or three dropper loops 10″ or so apart with the top loop trace cut 1/4″ from the knot. Standard 3mm red bead, #2 or #1 Mustad Ultra Point Demon Circle (upturned eye) snelled 6″ or so from the dropper knot. Double surgeon’s loop 12+” below the last trace for the weight. Bait with salted peeled shrimp bits, tiny pieces of cut bait, or fish bites.